Why customer experience is an accumulating asset, how going above and beyond translates into word-of-mouth marketing, and why employee empowerment is key. Why a remarkable customer experience is the best way to create word-of-mouth marketing. Where experts think CX is headed in 2018: AI, conversational commerce, more seamless and omnichannel customer journeys, and social media. Smart companies turn problems into opportunities, even if it’s a problem they didn’t create. This week’s article is “Heard the Forecast? Top CX Predictions for 2018: Influencers Speak” from Enhancier. They reached to top influencers in the CX and customer service space to find out where they think customer service is going. Predictions include how CX will work with AI, conversational commerce, the push toward a seamless customer journey with more omnichannel experiences, and how social media will become an even bigger part of the customer experience. Stick around for Dan and Joey’s predictions for 2018. Customer experience is going to be recognized by companies as the ultimate differentiator in 2018. All the touchpoints and interactions coming together is what creates the customer experience. Customer experience, like customer loyalty, is an accumulating asset. Joey came across a Facebook post about how Chewy.com helped someone through the difficult loss of both of her dogs. She received a shipment of dog food from Chewy in the week following the loss. When they heard what happened, they credited her purchase, asked her to donate the food to a local shelter, and sent flowers. The thing is, she’s not the only one—within ten days they heard about other two other great experiences with them. Even if a customer might leave, do your best to end the relationship on a positive note and in a meaningful way. Be aware of fast tracks to a personal and emotional connection, like pets or children. Going above and beyond is how you generate excellent word-of-mouth marketing. Joey’s little brother Casey works in Sales and Marketing for the Trinity Wound Healing Center in their hometown of Fort Dodge, Iowa. When he created a holiday card and got it printed at Walgreens, he was embarrassed to discover that it read, “If we can every be of assistance, contact us.” Obviously, it was supposed to be “ever,” and while he planned just to make a new purchase, Walgreens reprinted it for free. Always have someone check your work on anything that’s going to a customer. Empower your employees to do the right thing. Even if the customer causes the mistake, it’s your job to fix it. 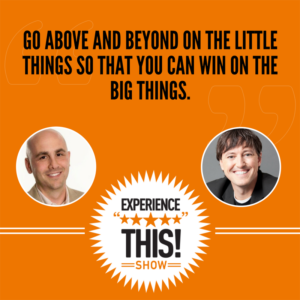 Go above and beyond on the little things so you can win on the big things. By 2018, more than 50% will implement significant business model changes in their efforts to improve customer experience. Customer experience is a major differentiator. So if you’re not focusing on it, you won’t be able to compete. Customer experience is the last differentiator, so every business should be focused on improving it. Dan Gingiss: Get ready for another episode of the "Experience This! Show." Joey Coleman: Join us as we discuss the hot new trends and expert predictions for customer experience in 2018. An online retailer of pet supplies that is connecting in heart felt ways with their customers offline, and the importance of helping customers that create their own problems. Dan Gingiss: Trendy, chewy, and every? Oh, my. Joey Coleman: There are so many great customer experience articles to read, but who has the time? We summarize them and offer clear takeaways you can implement starting tomorrow. Enjoy this segment of CXPRESS, where we read the articles, so you don't need to. Today's CXPRESS article comes to us from the folks at Enhancier.com, and is entitled: "Heard the Forecast? Top CX Predictions for 2018, Influencer Speak." What they did is they reached out to a number of great influencers in the customer experience and customer service space and asked them to make their best predictions for where customer experience was going to go in 2018. Dan Gingiss: Now there were a lot of trends and predictions cited in the article, some of which we've discussed on this show, including the unusual union between customer experience and artificial intelligence, conversational commerce, which is the blend between automated care and live human care, even more omni channel experiences that will be required to meet your customer where they are, and social media continuing to become a bigger part of the customer experience. Now that last one I've been talking about for quite a while, and I think that what a lot of companies are starting to see, especially the ones that have made customer service on social media a great experience, is that customers are reacting by making social media a channel of first resort rather than a channel of last resort. Joey Coleman: Absolutely. The article went on to actually poll predictions and trends from a number of our friends and colleagues including the fact that customer loyalty is an accumulating asset that you build over time, the importance of your mobile presence in an increasingly mobile, smart phone driven world, the real time snapshot of complete customer information and how important it is for your CRM to be accessible to everyone in your organization, so they can see all the touch points and be up to speed on everything that's going on with your customers, and the fact that the seamless customer journey is here to rule. I particularly loved that one, because the goal really should be to try to create a customer journey that is not only fun for your customers to go on, but seamlessly and frictionlessly moves from one interaction to the next. Dan Gingiss: I always love these prediction articles, and one thing that I think doesn't happen enough is, people going back a year later and seeing which one of these smart people actually predicted the future because there are definitely a lot of smart people there. There's like, I don't know, four or five dozen different predictions in this article. Did you have one that was a particular favorite or something that stood out to you? Joey Coleman: I did. One of the ones I really like came from Andy Yost, the chief marketing officer at Gannett and he said that 2018 will be the year of servicing consumer needs before they even arise. Brands leveraging the right data and analytics to deliver impactful customer experiences will rise to the top. Now in the article, they refer to this thread as data is the deity. For me, what I like about it is more the anticipatory nature of the activity that's expected from the brand and I do agree that the brands that I'm paying the most attention to and I'm most impressed by right now are the ones that are figuring out what I'm going to need as a customer before I even need it and having it right there ready for me when I reached that point. The anticipatory nature I think is something I, full disclosure, kind of building up what you said, Dan, I don't know that at the end of 2018, we're going to look back and say, "Oh look, everybody's doing this now," but I do think we're going to look back and say, "The best brands, the best in class leaders are making a commitment to anticipate the needs of their customers before the customers even articulate them." What about you? Did you have a favorite one? Dan Gingiss: Well, my favorite prediction came from a good friend of the show, Shep Hyken. Whenever Shep talks, I listen. He talked here and I am once again listening when he says, "The companies that best balance between technology and the human factor will win the hearts and dollars of their customers." I couldn't agree more and one of the concerns that I have had over the last year or so is the growing impact of chatbots, and that is technology interacting with customers, but one of the things that has made it a concern for me is that sometimes, a chatbot is a great way to get an answer to a question and sometimes we just need to talk to another human being. The companies that figure out how to have those things work together where you can get to the chatbot and answer a question quickly, but when you get stuck, you can get to a human and get your answer quickly. Those are the ones that are going to be providing those seamless experiences that you were talking about earlier and those are the ones that I think are going to win. Joey Coleman: I totally agree with Shep. As usual, he's a super smart guy and I agree with you as well, Dan. You're a mostly smart guy as well. I think it's definitely the case that this human factor is really something we need to be focused on. There's so much chatter about technology. You need to keep the human element going to especially as the world becomes more and more tech focused and tech driven. How about you, Dan? Out of curiosity, care to venture a prediction for the year ahead or spot a trend that you think is going to be dominant in 2018? Dan Gingiss: Well, I do, but first, I want to go back to your comment that I'm mostly a smart guy. I just want to tell our audience that I think you're sort of a smart guy, too. Joey Coleman: I appreciate that. Thank you. Dan Gingiss: Anyway, my prediction is that 2018 is finally going to be the year with the best in class companies figure out that customer experience is the last true differentiator and they're going to figure this out because we know the competing on price doesn't work. Nobody makes money that way, and we know that products and services can be knocked off so easily that even a unique product or service, it's hard to stay unique for long, but what's really, really difficult to copy is an amazing customer experience and that is because that experience is almost always delivered by humans and because your competition does not have the same humans that you have, by definition, it will be very difficult for them to duplicate what you're doing. I think that some companies are figuring this out, some companies have known it for a long time but I think 2018 is finally the year where we're going to see a lot of industries. If the last couple of years was maybe the Uberization of industries and that was the big impact, I think this year is going to be the year where a number of industries start to figure out or at least the leaders in those industries, that experience is going to be the way to differentiate. Joey Coleman: Love it. Love it. I'm going to go ahead and mention one myself. I think what we're going to see the best in class organizations doing this year is focus on the physical. Here's what I mean by that. I think in recent years, there has been a push to digitize everything. What is your digital experience? What is your social experience? Everything is about moving the touch points and the interactions into either a mobile-based or a web-based internet driven environment. I think what's happening is the pendulum has swung so far that we're actually going to see the best companies going back to the old school approach, the physical touch point. Whether that's the hand written thank you note, or the unexpected item you get in the mail or the sweet little interaction that doesn't occur via an email or a text message. I think focusing on the physical is going to be really interesting. Dan Gingiss: My apologies for this phone ringing. Joey Coleman: And as if the digital gods could hear me blaspheming the role that digital is playing in our society, the phone wanted to start ringing in the back of our recording. Again, I reiterate, focus on the physical. Get out of the digital, get back to the real world interaction. I think the key takeaways here from our CXPRESS article are number one, customer experience is going to continue to be a major point of focus for companies in 2018. As my good buddy and colleague, Dan Gingiss says, he believes that the big trend of the year will be companies recognizing this as the ultimate differentiator, and I agree with them. Number two, you need to be paying attention to a variety of items that impact the customer experience from the social to artificial intelligence, to live conversations, to your CRM tools. There are a lot of pieces. We get that this is complicated, but it's everything coming together, all the touch points, all the interactions are really what create the customer experience and number three, customer experience like customer loyalty is an accumulating asset. You need to keep making investments into the customer experience because overtime, those investments accumulate into wonderful things for you and lead to some incredible returns. Let's make 2018 the best year for customer experience yet. Dan Gingiss: Happy New Year everyone. Joey Coleman: We love telling stories and sharing key insights you can implement or avoid based on our experiences. Can you believe that this just happened? Every once in a while, I'm cruising through my Facebook feed. I pretty much only do Facebook when I'm on mobile like in a cab going between events or whatever and I stumble across a great example of a company seeing in real time the benefits of creating a remarkable customer experience. This happened recently as I was again in my Facebook feed, I saw a post from a friend of mine that was actually sharing a post from a friend of theirs named Laura. Now, I don't know Laura but the example was so great, I wanted to share it with our listeners and I'm quoting directly from her post. My sister and brother-in-law tragically lost both of their dogs this past weekend. After this happened, they received two 40-pound bags of dog food that they had ordered from chewy.com. My brother-in-law sent them an email requesting permission to send the dog food back for refund minus the shipping cost. They responded with unbelievable kindness. They credited their credit card for the full purchase price and asked them to donate the dog food to a local shelter. They then sent a second email requesting a picture of one of the dogs to put in their memorial book to honor her. Then today, my sister and brother-in-law received these beautiful flowers from chewy.com. I wish I could tell everybody this story. This is the kind of story that needs to go viral. This is an incredible company. Joey Coleman: He's not making this up, folks. This is the truth. We are not embellishing the cat count for audience pleasure. It's five cats. Dan Gingiss: Yes. In fact, my good buddy, [Chris Trob 00:12:16] likes to use the #gingisscats on Twitter every once in a while when I post pictures of them, but what's amazing to me here is that in the span of ... Not making this up, maybe 10 days, you found this post on Facebook, a friend of mine from high school told us about his experience with chewy.com. Then, another listener of ours left a message on our SpeakPipe widget about the same company. Obviously, this company is doing something right. I'd like to next play a clip from a high school friend of mine named Mike. Mike: In a time when so many companies especially internet companies outsource their customer service or minimize it, chewy.com's approach really made an impression on me and I always take my business first to organizations that show they value our relationship and the folks that Chewy showed me they see the bigger picture. Just to give a little back story, I adopted my cats, Homey and Sammy 17 years ago and other than a few treatable health issues, they live a happy, healthy life. That was until Homey took a turn for the worst. It was clear borrowing a miracle, he wasn't getting better and I knew I'd have to face the difficult decision for him to be put to rest. It was then that I got a notification from Chewy that Homey's doctor prescribed food was soon was shipped, so I knew I needed to call to cancel. I spoke with one of their reps, Diane, I'm sure she can tell I was taking it hard. I wasn't ready for him to go and besides processing my request, she took a few extra moments to offer condolences and talk to me about him. I remember thinking when I got off that she cared and I really appreciated that. That could have been the end of it. I was no longer ordering from their site, so they could have forgotten about me but surprisingly, they did ... A couple of days later, my wife and I were touched and surprised to receive a beautiful bouquet of flowers in a vase with a handwritten note offering more condolences from Diane and the Chewy team. It was a really nice gesture that won't be forgotten. It made us feel good and the power of that is obvious. It compelled me to share my story and pictures of a flowers on social media telling countless others. I've already been back to the site looking to make more purchases because of it. That good comments grows and spreads. Their emphasis on building their customer relationships beyond just processing transactions especially one like mine that would seem to be a last transaction, ultimately built a stronger bond between me and their company and I think it develops a little customer based and spreads the word better than any advertising campaign can. I wish more companies took chewy.com's approach. Joey Coleman: It's a similar story in some ways to what we heard from the first example from Laura, but what I love about it is they're recognizing when a customer of theirs loses their pet, which is the connection to why the customer's doing business with chewy.com. They're recognizing the emotions that the customer's going through and I think that's so in some ways, obvious and yet in most ways, completely rare in our society. We talk a lot on this show about the holy grail of customer experience to create the lifelong customer and chewy.com is doing an incredible job here of saying, "We recognize that you may not be a lifelong customer, but we're going to give you a lifelong experience. We're going to give you an experience that not only you remember for as long as you live, but that you're going to tell other people about because it's so profound and it's so meaningful." We always talk about the goal of trying to get more marketing or build buzz or get more word of mouth. There's no way that you can do this better in my experience than taking a situation that probably is Dan points, how it means that you might be losing the customer forever due to nothing that you did wrong, and making sure they have an incredible experience on the way out. Dan Gingiss: Obviously, this company is doing something incredibly right and what I love here is first of all, that you mentioned that they are very attuned to the emotions that go along with losing a pet. It's one of the hardest things obviously by having a pet, but going through the loss of pet is like going to the loss of a family member and it is a very difficult time. What I think is absolutely extraordinary about this though is that it is possible that most of these people will cease being customers of chewy.com because they no longer have a pet. It's a very, very interesting time for chewy.com to be reaching out to them. Now, I assume that maybe these customers in their future will become pet owners again. Often times, we need to take months or even sometimes, years before we do that because it's very hard to replace a pet and certainly if they have a pet in the future, they will go back to chewy.com, but I find it particularly fascinating that they're willing to be this kind and show this public display of kindness to people who may end up becoming former customers. Joey Coleman: Again, in the category of you can't make this stuff up within the same 10-day period that Dan heard about the story from Mike and I saw the Facebook post from Laura, we received a SpeakPipe message. If you go to experiencethisshow.com, we have this whole SpeakPipe widget, you can record a message for us. We heard from one of our listeners about the experience she had. Let's go ahead and listen to that now. Morian Hill: Hi, Dan and Joey. This is [Morian Hill 00:16:16] from Boston. I actually send you this message because I just had a great experience with a company called Chewy. I don't know if you have heard of them. Basically, they're an online store for pet supplies. I signed up with them and I was planning on getting my cat's litter and food from them. They, of course, deliver it to your house so it was so convenient for me. Basically, I got my first order. It was great. Food, litter and some toys for my cat and when it was time to get my second order because I signed up as an order shipment, so every amount of weeks, I will get the same order redelivered. The main one I actually put in was delivered. It went a couple of hours and it was not on my porch, so I emailed them. They emailed me back so quickly and they were like, "We're going to send you another box with everything free of charge. If you happen to get the first box, you can just keep it. It's fine. You keep it for free." Actually, the next day, I got both boxes. If you think about it, they just literally sent me an express shipment a couple of hours because it was an overnight and I got both boxes on the same morning. That was great. My cat got some free food, and a week after it, I've actually gotten a mail, a post card for them that has a cartoon of a dog with a surf board in Florida and it says, "Greeting from Florida from your friends at chewy.com." On the back is handwritten and it says, "Hi, Morian Hill. Welcome to Chewy. I hope your fur baby loves the [JWL 00:17:50] pet cat toy. Paws and kisses, Jenny with a smiley face." I love the fact that it's handwritten and they actually put attention to put the toy that was delivered on my first box with them. Yeah. I think their customer service is like topnotch. They're very fast and the fact they're sending this is amazing. I just have it on my fridge and I tell everyone that my cat has received a mail from Chewy, which is great. Joey Coleman: Chewy is just getting it right in so many ways. I think the key takeaways of the various examples that we had that came in from chewy.com interactions are number one, be ready to respond in moments of tragedy that might cause your customers to leave. You want to do your best to end the relationship on a positive note and in a meaningful way. Number two, connecting with someone about their pet is a fast track to a personal and emotional connection. To be respectful, I'm not a pet's guy but when you run into folks who have pets and children, nine times out of 10, they're more excited to talk about their pets than their kids. This is a fast track to their heart. It is a fast track to an emotional interaction. Whether you operate in a business that sells the pets or not, if you are a pet person and connect with a customer who's a pet person, you just brought a whole new layer of depth to the relationship. Finally, number three, going above and beyond is the way to get your customers to sing your praises. Not only to their friends and their family, but to the public at large. A little handwritten note, a special toy and unexpected surprise is the way for you to build remarkable customer experiences that lead to great word of mouth marketing for your business. It's shocking how often people use 38 words to describe something when two would do the trick. We are looking at you, lawyers and accountants. Words matter and there is no excuse for trying to hide what you need. We explore words in messaging in this next generation of "Say what?" Dan, I want to tell a story about my little brother, if I may. My little brother, KC, works doing sales and marketing for the Trinity Wound Healing Clinic in Fort Dodge, Iowa. The small town in northwestern Iowa where I grew up. I knew he's my little brother and I know I'm biased, but he is great at his job. He's super creative. He's always willing to do these insane things. For example, around the holidays, he dresses up in these suits. He goes around meeting with doctors at different hospitals trying to get them to refer their patients that need additional care and healing wounds to the wound center that he works and runs marketing for. At Thanksgiving, he'll dress up as a turkey. At Christmas, he'd dress up like Santa. Easter, an Easter bunny. You get the idea. He's always putting on costumes and handing out candy and doing things that are meant to drive attention to the wound center and have fun with it too because if you know anybody that's ever worked in medical sales or working with doctors as reps, it can be kind of a not so great experience, not only for the reps, but for the doctors and their staff as well to basically have all these reps coming in constantly barraging the with stuff. He tries to make it really fun for folks, which is again, I'm super proud of him. He does an awesome job. Dan Gingiss: Yeah. It's not surprising to me for some reason that little Coleman is as creative as maybe big Coleman is, and that you have a little brother that dresses up in turkey and Santa suits. [crosstalk 00:23:43]. Joey Coleman: Right. You're kind to say. Yes. We are definitely siblings in our behaviors and attitudes, but what's interesting, the experience he had recently that I found was interesting and wanted to share with our listeners was he needed to create a holiday card. Now, KC has a background in graphic design. It's what he majored in and so, putting this stuff together for him is pretty easy and he put together the design of the card and he went to the local Walgreens to print out this card that they were going to send to the various doctors they do business with. What he wanted the card to say is, "If we can ever be of assistance, contact us." Alas, when he got the printed cards back, it said, "If we can every be of assistance." Now, not the end of the world, but definitely not what he wanted it to say. It didn't make sense. As we said on the show before, bad grammar, it reflects poorly on the organization. That's the whole purpose of the "Say what?" episodes. This was not a good situation for him to be in. Dan Gingiss: Okay. How did he creatively get himself out of this? Joey Coleman: Well, this is just pretty interesting. Now, his initial thought was, "I'll just redesign it. I'll reprint it and we'll be good to go." But he went back to Walgreens. He explained this situation and they were amazing. They were like, "Look, no problem. No problem. Let's strike that extra Y that we don't need there, so that it can go back to saying, 'If we can ever be of assistance.'" They then reprinted all of the cards for free. He didn't have to beg. He didn't have to plead. He didn't have to write letters to corporate. He didn't have to threaten lawsuits. They just did the decent thing. They recognized that it was his mistake, not their mistake, but they still helped them solve the problem. Now, my buddy, Clay [Bare 00:25:39] and I do a presentation called "Carpe Defect." It's how to take your mistakes and turn them into your marketing, right? Your carpe the defect. My wife has come up with this great phrase for what we do where she says, "It may not be your fault, but it's your problem." That's exactly how Walgreens handled this situation. It wasn't their fault that the words were wrong on the holiday card, but it was their problem and they solved it in a beautiful way. Dan Gingiss: Well, I would say they made it their problem because many companies would say, "That's not our problem." Technically, they're probably right but the fact that Walgreens made it their problem, I think is what makes this remarkable and to your point, they didn't give your brother a hard time. They just did what was right to fix the issue and in this particular case, I can hear some listeners saying, "Well, probably it doesn't cost them a lot to reprint the cards. That's why they did it." That may be true, but I think there's more to it than that because you have to have an employee, for example, that is trained to take care of customers and that is empowered to be able to reprint some cards for free even if it does some lose for Walgreens. Obviously, the result here is at any time your brother needs cards or photos or anything or frankly, Ibuprofen, he's probably going to be shopping at Walgreens. Joey Coleman: Absolutely. You know what's fascinating? We talked a lot about how, when you create a remarkable experience, people want to tell that story. He told me this story over at the dinner table while we were talking one night, and it immediately was something that I wanted to share with our listeners and I also asked him. He's told several of the other offices, the doctor's offices that he works with about this. He's admitted, "Oh, there was this crazy thing, but by the way, Walgreens did an amazing job." They've gotten a ton of free publicity in the local market and now hopefully in an international market with our listeners about what a great experience they had, and it's your point about people saying, "Oh well, it was an inexpensive fix." Folks, it's usually in an inexpensive fix. You're fooling yourself to think that doing the right thing is costly. Doing the right thing is the only option if you want to build a long term successful brand with loyal advocates and raving fans. I think the key takeaways from this experience are number one, always have someone check your work when sending out a mass promotional piece or a letter, or anything that's going to go to multiple customers. Even if it's just going to one customer, take the time to read it again and read it out loud and make sure that you got it exactly the way you want. Number two, empower your employees to do the right thing. Walgreens clearly established at least in this store, a culture where the employee who my brother dealt with in the printing department felt empowered to say, "We're going to reprint this for free." Number three, as my wife is fun to say, "It may not be your mistake, but it's your problem." Even if the customer causes the mistake, it's your job to fix it. Last but not the least, a bonus takeaway if you will, patronize a company like Walgreens. Be a company like Walgreens. Go above and beyond on the little things, so that you can win with the big things. 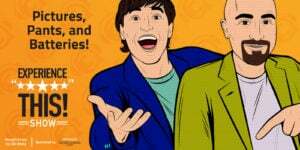 Listen in, while we try to stump and surprise each other with a fantastic statistic from the worlds of customer experience and customer service, it's time to check out this number. Okay, Dan. This week's number is more than 50%. What do you think it means? Dan Gingiss: Well, I know you love it when I give you baseball references, Joey. Joey Coleman: Oh, I do. Dan Gingiss: I'm going to go with the yogi bear is that 80% of the game is half mental. Joey Coleman: He did have a way with words. Yes. Actually, this statistic comes from research done by Gartner and it refers to the fact that by 2018, so now, more than 50% of organizations will implement significant business model changes in their efforts to improve customer experience. Dan Gingiss: Well, I think that certainly makes sense. More than 50% leaves us a lot of room, so I'm hesitating and thinking like, "Is this 51% or is this like 90%?" Because I really think that it should be pretty close to 100%, but it will implement a significant business model changes in a reference to improve customer experience because if you do not do this, people, your business is going to be left behind because other businesses have caught on the customer experience as a differentiator. They're focused on it. If you are not, you're going to be left focusing on something like price or product, which unfortunately, is so 2017. Joey Coleman: Folks, this is your year. Act now to improve the customer experience. For more great customer experience content and powerful statistics like these, visit smartercx.com/experiencethis and don't forget to use that little landing page, the smartercx.com/experiencethis. That way, our incredible sponsors at Oracle know you're listening. Thanks so much for checking us out. We hope you've enjoyed this episode of Experience This!, and we know it's going to be a fantastic year ahead of creating remarkable customer experiences.